WASHINGTON, DC, June 30, 2011 (ENS) – A federal judge today upheld a 2008 U.S. Fish and Wildlife Service decision to protect polar bears under the Endangered Species Act because climate change is threatening their survival. 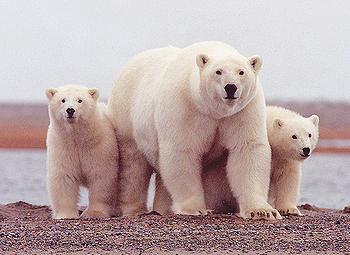 The polar bear was the first species added to the Endangered Species List due solely to the threat from global warming. U.S. District Judge Emmet Sullivan dismissed challenges to the listing brought by the state of Alaska under the leadership of then-Governor Sarah Palin, and hunting groups, who argued that the listing was unnecessary. They contended that the bear is protected by other laws and that the science does not allow prediction of what effects climate change will have on the species. Judge Sullivan ruled that the Service’s decision to protect the bear due to the melting of the Arctic sea ice was well supported. Scientific studies show that, due to the rapid melting of its Arctic habitat, two-thirds of the world’s polar bears, including all the bears in Alaska, are likely to become extinct within the next 40 years. Despite finding the evidence of the severity of the polar bear’s plight “troubling,” Judge Sullivan declined to raise the threat level of the species from threatened to endangered. “It is not this Court’s role to determine, based on its independent assessment of the scientific evidence, whether the agency could have reached a different conclusion with regard to the listing of the polar bear,” the judge wrote in his ruling. The polar bear’s Endangered Species Act listing was the result of a 2005 petition and litigation filed by the Center for Biological Diversity, Natural Resources Defense Council and Greenpeace. The three groups also intervened as defendants in this case to support maintaining protections for the bear. “This decision is an important affirmation that the science demonstrating that global warming is pushing the polar bear toward extinction simply cannot be denied,” said Kassie Siegel, director of the Center for Biological Diversity’s Climate Law Institute. “Polar bears retaining their protections is key – this was a big loss for the climate deniers who find the bears’ plight inconvenient,” said Andrew Wetzler, director of NRDC’s land and wildlife program. The distinction between the threatened and endangered categories is that, if a species is considered threatened, the Service can issue special rules reducing its protections. For the polar bear, the Bush administration issued a special rule that exempted greenhouse gas emissions, pesticides, mercury and other pollutants that harm the bear from the reach of the Endangered Species Act. The conservation groups’ challenge to that rule is still pending in court. “The court’s decision is bittersweet – it acknowledges the devastating impact of global warming on polar bears, but fails to provide the species with the level of protection it needs to survive into the next century,” said Melanie Duchin, Greenpeace Arctic campaigner.